Seeking better pay and benefits, workers at San Francisco’s Anchor Brewing Company voted in favor of forming a union on Wednesday, according to Bloomberg. The vote to organize with the International Longshore and Warehouse Union passed 31-16, the San Francisco Chronicle reported. Anchor, which was acquired by Japan’s Sapporo Holdings Limited in 2017, now has 10 days to dispute the vote. The ... Maggiori informazioni effort to unionize has been met with multiple “union-busting” tactics from Anchor management, despite a February 14 pledge to remain neutral. According to Huffpost, management “pressured the 61 brewery workers and nine staffers at Public Taps,” its neighboring taproom, to form separate bargaining units. Public Taps employees are slated to vote on whether to form a union later today, according to the AnchorUnionSF Twitter account. Additionally, Anchor management reportedly intimidated employees during private meetings and threatened years-long wage freezes. In turn, employees filed an unfair labor practice complaint with the National Labor Relations Board earlier this month alleging management deployed union-busting tactics, including ordering employees to remove pro-union pins while on the job, Bloomberg reported. Next Green Wave Holdings, a vertically integrated California cannabis company, issued a press release Tuesday erroneously indicating that San Diego’s Thorn Brewing had been sold. 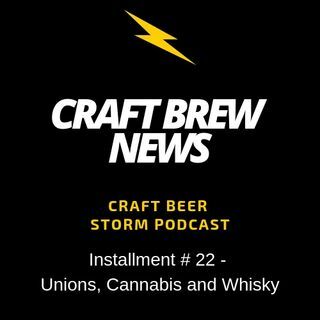 Speaking to Brewbound, Thorn Brewing co-founder Dennis O’Connor confirmed the brewery was not a part of Next Green Wave’s $27 million transaction, which included the acquisition of more than 45 CBD and THC products. Next Wave Holdings actually purchased SD Cannabis, a company O’Connor said he has been working with independently on the development of water soluble THC and CBD products. The relationship with SD Cannabis developed after Thorn Brewing released a 4.20 percent ABV session IPA called OG HighPA, which was brewed with cannabis-derived terpenes. That product, which contained no THC or CBD, was released in 2016 and was made in collaboration with Jetty Extracts. But O’Connor was still interested in creating a cannabis supplement that could be added to various beverages, so he teamed up with SD Cannabis to research and develop a new product. “You’d buy it at a local dispensary, and mix it with your beer or your whiskey,” he said, noting that the company plans to launch the products next month, on April 20 (4/20). He also envisions mixologists experimenting with the THC and CBD mists. In an Austin American-Statesman op-ed titled “State beer sales laws aren’t broken. Leave them alone,” Larry Del Papa, a wealthy beer distributor, argued that allowing Texas’ manufacturing breweries to sell beer for off-premise consumption would harm independently owned grocery, convenience and liquor stores. Del Papa serves as the president of the Wholesale Beer Distributors of Texas (WBDT), a powerful wholesaler lobbying group that has refused to sign onto a “stakeholder agreement” reached between the Texas Craft Brewers Guild and the Beer Alliance of Texas. If passed by lawmakers, that agreement would put an end to a years-long contentious dispute over to-go-beer sales by allowing manufacturing breweries to sell beer for off-premise consumption within the state’s existing 5,000-barrel cap on direct-to-consumer sales. According to Del Papa, only 10 craft breweries would benefit from the legislation. The rest of the state’s 305 other breweries, Del Papa argued, could operate under brewpub licenses due to falling below the 10,000-barrel cap. However, Austin Beerworks co-owner Adam DeBower told Brewbound that the law change would benefit hundreds of brewers, fostering growth that could expand those companies’ production beyond the 10,000-barrel cap.